In general, African Violets need just enough water to keep the soil moist, but never soggy. Too much water will leave your African Violets susceptible to such deadly pathogens as Pythium, Root Rot and Crown Rot. Overwatering can also cause denitrification, a condition that prevents plants from getting the nitrogen they need. Keep soil moist to dry, and allow soil around roots to dry out before watering to encourage blooming. 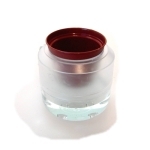 Water from the bottom with room temperature water by placing the plastic grower's pot in water, and allowing the plant to absorb the water, but not for more than 30 minutes. Avoid getting water on the leaves as this can cause spotting damage. Never use soft water. Soft water increases the saline content, diminishing your African Violet's ability to absorb water and nutrients. Avoid using highly chlorinated water. For best results, use violet plant food as directed. By providing the correct amount of water, a good self-watering device will greatly reduce the chances of getting any of the deadly fungi that cause plants to rot. In addition, because a good self-watering device waters from the bottom, it eliminates the potential hazards of watering from the top, i.e., leaf spots. 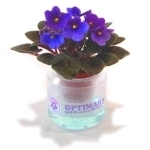 To ensure correct watering, we strongly encouraged to use a recommended self-watering device, such as the Optimara MaxiWell (for 4-inch standard Violets), MiniWell (for 1-inch super miniatures) or the Optimara WaterShip container, a spill-proof, self-watering device for 2-inch miniatures.